Long gone are the times of the marketer in power where push-marketing was the order of the day and long-term customer relationships were normality (see Figure 1). New channels and emerging technologies facilitate the access and sharing of information, resulting in a power-shift towards the consumer (Christodoulides, 2009). Those empowered consumers decide for themselves where, how and which voices to hear (Winer, 2009). Thus, the hitherto prevailing paradigm of push-marketing has been replaced by pull-marketing. Companies move away from the idea of interrupting the customer with advertisements but rather turn him from a passive recipient to an active actor, creating a much higher awareness for the product without aggressively marketing it (Hanna, Rohm & Crittenden, 2011; Muniz & Schau, 2011; Wind, 2008). Furthermore, an incredible noise on the internet in the wake of an ever-increasing amount of virtual marketing activities exacerbates the difficulties in communicating with the consumer (Ralphs, 2010). New tools and approaches are required to successfully break through that noise and approach the customer online (Wind, 2008). Here, the upcoming but by the existing research not yet sufficiently investigated concept of gamification offers promising prospects. Customers are engaged in a playful way with a firm's marketing activities, which enables the marketer to gain their attention, enhance their motivation to interact and eventually break through the prevailing noise of the manifold marketing activities in the internet. This paper will address this research gap and the potential of gamification as a vehicle for increased customer participation. The new consumer in the internet era is characterized and a closer look is taken on how to approach him through the concept of gamification. Nike - being a prime example for this new kind of marketing with its Nike+ program - serves to exemplify this young phenomenon. New digital tools and multiple-channel interaction have empowered the consumer companies are facing nowadays when conducting marketing online (Krishnamurthy & Kucuk, 2009). Successful marketing today is about "participation, sharing and collaboration rather than straightforward advertising and selling." (Kaplan & Haenlein, 2010, p.65) The new breed of consumers chooses actively in which marketing activities to participate. They want to be entertained and seek the proximity to other consumers with whom they can interact, compete and share information (Wind, 2008). Due to that proceeding power shift, it is impossible to control today’s consumers any longer but instead, interacting with them is of paramount importance (Winer, 2009). Moreover, not only the consumers themselves but also the environment they are acting in has changed in the wake of the Web2.0 era. Actions and voices are much more far-reaching, the possibilities to (inter)act manifold and communities gain in importance evermore (Berthon, Leyland, Plangger & Shapiro, 2012). The marketer’s role in this has become to facilitate consumers' online activities, interactions and building of relationships with a brand and other consumers (Christodoulides, 2009; Armelini & Villanueva, 2011). Moreover, enjoyable ways to engage are required to gain customer attention and motivation to interact (Baird & Parasnis, 2011). By doing so, marketers are able to gain valuable insights, trigger word-of-mouth (WOM), encourage engagement and increase awareness (Barwise & Meehan, 2010; Kaplan, 2011; see Figure 2). Derived hereof, a thorough understanding of the consumers’ needs and wants is achieved, enabling a marketer to develop adequate strategies and track and influence their beliefs and attitudes toward a product or brand (Weinberg & Pelivahn, 2011). 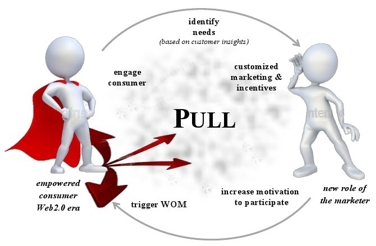 This leads to the creation of pull for a product on behalf of the customer, enabling the marketer to overcome the almost overwhelming power of the new consumers and win them over again to the company's side (Fournier & Avery, 2011). In the wake of the changed prerequisites for marketing in an online context, a promising new concept called "gamification" has emerged. Evermore studies and the adoption of the concept by companies worldwide attest the arising importance of gamification as an adequate tool to meet the new consumer of the internet era (Meloni & Gruener, 2012). Gamification has its roots in game theory and is "the use of game design elements in non-game contexts" (Deterding, Khaled, Nacke & Dixon, 2011a, p.1) to make routine activities more engaging and fun (Schwerdt, 2012). By offering customers various incentives in a goal-based system, gamification touches upon the human drive to play and compete (Newman, 2012). Desired activities such as posting, sharing, or registering are made enjoyable through awarding of virtual and tangible rewards like badges, points, or special offers (Nicholson, 2012). Like any form of marketing, gamification strives to influence consumer behavior. By engaging consumers repeatedly in the game created around a brand and making desired actions enjoyable and rewarding, marketers can increase interaction and influence behavior as customers work towards receiving these rewards (Zichermann & Cunningham, 2011). Moreover, gamification serves a marketer's need to understand the customer as valuable data and insights can be mined by engaging the consumer in a gamified application (Kapp, 2012). When trying to understand what motivates consumers to engage in gamified activities, Self-Determination Theory (SDT) comes into play. SDT, being empirically grounded in Maslow's "Hierarchy Of Needs" (Maslow, 1943), is central for explaining the motivation of consumers to engage in the Web2.0. Proposed by SDT, the innate human needs that drive motivation are autonomy (perceived self-determination of one's own actions), competence (perceived ability to master a task), and relatedness (perceived social affiliation to others) (Ryan, Rigby & Przybylski, 2006). Gamification serves as a powerful tool as it provides the marketer with the possibility to capitalize on these needs and trigger motivation for favored behaviors. Firstly, consumers experience relatedness by interacting with other people in the community via the platform the company provides hence, feeling connected to them (La Guardia, Ryan, Couchman, & Deci, 2000). In order to satisfy customers need for competence, it is important to challenge them in a way so they are neither un-, nor over-challenged in order to maximize their motivation and further the bond with them (Ryan et al., 2006). Hence, consumers are motivated to keep on interacting and engaging in the activity conducted. Finally, if activities are performed for interest or personal value, i.e. if a consumer can choose when and how to participate, perceived autonomy is high (Deci & Ryan, 1985), which again reinforces the willingness to engage in gamification. "Provisions for choice, use of rewards as informational feedback (rather than to control behavior), and non-controlling instructions" (Ryan et al., 2006, p.349) have been proven to augment autonomy and thus intrinsic motivation. For online gamification activities, the reach is much larger, resulting in an even stronger opportunity to satisfy those needs as achievements gain wider recognition and displaying success is facilitated. Online, the facet of relatedness becomes more intense as the community in which a person can interact is much larger. Competence is enhanced through an instant overview of one's progress and achievements (also in relation to others) by obtaining direct feedback via the gamified application. Moreover, the perceived autonomy is much higher as consumers are presented with manifold ways of engaging and interacting in a virtual setting. Derived hereof, one can speak of SDT+ when applying that concept to a virtual context (see Figure 3). By leveraging these intrinsic motivation needs, intertwining game mechanisms with a firm's marketing activities can help to enhance engagement and motivation towards a brand, increase the likelihood of staying involved in future interactions and steer customer behavior in a favored direction. A company that has taken advantage of gamification extremely well is Nike. With the Nike+ application, the company utilizes a technology that motivates people to exercise by tracking runners' data and connecting them to other runners worldwide via the online platform nikeplus.com (Nikeplus, 2013). Physical activity during the day can be measured and covered distance, speed, as well as the calories burned examined on the Nike+ website. Users are enabled to set personal goals, measure achievements and share and compare their results online to those of other community members. Based on the personal progress, points are awarded for the completion of tasks (see Figure 4). Nike manages to interact with the consumers and engaged them as their intrinsic self-determination needs can be satisfied through Nike+. Hence, the motivation to engage and stay on task is fostered. Through engaging and inter-exchanging in the large, worldwide community of Nike+, users experience a strong feeling of relatedness to other members. Instant feedback through the comparison with former results and the achievements of others, the gaining of rewards for reaching milestones and the possibility to monitor progressions increases the feeling of competence. Moreover, by engaging voluntarily, anytime, to self-determined milestones, the user perceives a high degree of autonomy. Therefore, Nike manages to provide the facility to satisfy the intrinsic needs underlying consumers' motivation to engage. The real-life satisfaction of those needs is harder to establish without the virtual aid of Nike+ which displays the enhanced potential of a virtual context to motivate and engage consumers (SDT+). This best practice example clearly shows the benefits of gamification. Even though not all users of Nike+ are actually consumers of the company's products, the gamified platform brings about an increase in conversations and WOM about the brand as well as an augmented brand exposure. With Nike providing the platform, the user automatically interacts with the brand, provides valuable customer insights for the firm and can be influenced without even being aware of it. The gamified application at the forefront benefits the brand in the background through increased brand awareness, loyalty and the collection of meaningful customer data, which can in turn be used to further optimize the gamified marketing activities (Sing & Sonnenburg, 2012). The functioning of the concept has been evidenced by practice as well. Studies showed that Nike+ significantly fostered the sales of the company's running shoes and accomplished to build up a large, interactive user-base that benefits customer and company alike (Ryan, 2010). Gamification is becoming an extremely powerful marketing tool that enables marketers to pass on and engage consumers in content, thereby enhancing communications about and loyalty towards the brand in the background (Simões, Díaz Redondo & Fernández Vilas, 2013). According to a recent Gartner study, about 70% of Global2000 organizations will make use of gamification over the next years (Gartner, 2011). To attract the new breed of customers on the internet, companies utilize gamification to touch upon basic human needs and reward consumer engagement with their fulfillment by providing platforms for activities that enable consumers to experience autonomy, competence and relatedness. The consequently increased motivation to engage enables brands appeal to and reach widespread consumer groups (Deterding, Sicart, Nacke, O'Hara & Dixon, 2011b). However, most of these gamified applications will underperform because they are poorly designed (Burke, 2012). Just like with any other online marketing activity, it is crucial to define the target audience carefully in order to provide meaningful incentives and keep customers interested and engaged (Singh & Sonnenburg, 2012). Gained customer insights must be used to target efficiently and customized to stay ahead of the game (Barwise & Meehan, 2010; Varadarajan & Yadav, 2009) as can be seen based on Nike, which continuously customizes and capitalizes further on the intrinsic needs by adapting its platform based on data analysis (Nikeplus, 2013). Moreover, external rewards must not be so strong that they replace a consumer's intrinsic motivation to engage and interact (Knipp, 2012). A user's experience of autonomy, competence and relatedness has to be guaranteed when designing the gamified application rather than merely motivating by rewards. This will trigger and maintain engagement, make the product appealing and create an interactive user-base (Deterding et al., 2011a). Finally, a firm must ensure to find the right balance between presence and abstinence. The consumer should not get the feeling of being interrupted or build up resistance against the application as such due to perceived manipulation through the marketer. However, when the connection to the brand is not obvious, the marketing effect might never materialize as seen in the case of Crazy Chicken and Johnny Walker (Hachen, 2007). It needs to be kept in mind that the main share of marketing online is all about social interactions between people (Fournier & Avery, 2011). Consequently, the marketer must ensure to facilitate those interactions, staying on the sideline to eventually make consumers "play the brand’s game" (Fournier & Avery, 2011, p.195). The case of Nike+ exemplifies that gamification provides a tool that is adjusted to the new consumer and his altered environment in the Web2.0 and can eventually shift power back to the marketer as long as attention is paid meticulously to play by the new rules prevailing in today's marketing world (Barwise & Meehan, 2010).